The performance of autonomous robots, i.e. robots that can make their own decisions and choose their own actions, is becoming increasingly impressive, but most of them are still constrained to labs, or controlled environments. In addition to this, these robots are typically only able to do intelligent things for a short period of time, before either crashing (physically or digitally) or running out of things to do. In order to go beyond these limitations, and to deliver the kind of autonomous service robots required by society, we must conquer the challenge of combining artificial intelligence and robotics to develop systems capable of long-term autonomy in everyday environments. This talk will present recent progress in this direction, focussing on the mobile robots for security and care domains developed by the EU-funded STRANDS project (http://strands-project.eu) which have so far completed over 106 days of autonomy in real service environments. In particular the presentation will cover our approach which combines probabilistic verification and machine learning to produce a planning system which controls how the robots select and execute their tasks over these extended periods of autonomy. Nick Hawes is an Associate Professor of Engineering Science in the Oxford Robotics Institute at the University of Oxford. His research applies techniques from artificial intelligence to allow robots to perform useful tasks for, or with, humans in everyday environments (from moving goods in warehouses to supporting nursing staff in a care home). 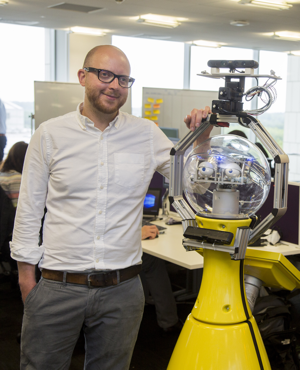 He is particularly interested in how robots can understand the world around them and how it changes over time (e.g. where objects usually appear, how people move through buildings etc. ), and how robots can exploit this knowledge to perform tasks more efficiently and intelligently.